Earlier last year my boss gave me the first six seasons of King of the Hill as a gift, but I’ve had a longstanding admiration for the show and had seen most, if not all, of the episodes. Re-watching the show uncovered old memories and reflections that compelled me to write what you are about to read. I was exposed to the show both when I was a young kid and an adult, first watching the episodes on Fox during the celebrated Sunday night lineup, and catching re-runs on Cartoon Network’s adult programming block, Adult Swim. For those not familiar with the premise (heaven forbid it), the story is centered around the Hills, a family living in a Texan small town called Arlen, based off of other cities found in the DFW Metroplex. Even though the population is around 140,000 people, local tradition is defiantly proud, with many people out on their doorsteps supporting parades, high school football games, and patronizing local business, all centered close to the town. Outside the city limits, other small towns with their own traditions and cultures staunchly enforced, rival that of Arlen, the chief being the town of McMaynerberry. The entire show focuses on the rural life of Middle America with a comedic, astute level of detail. 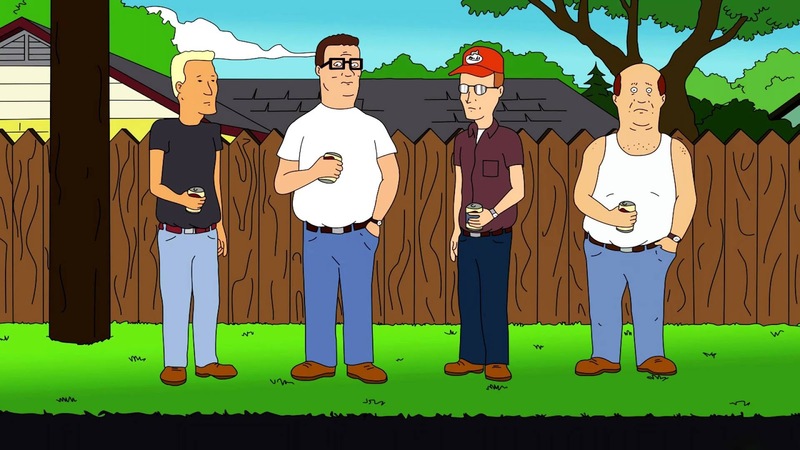 The show’s creator, Mike Judge, who grew up in Texas in a town very much like Arlen is privy and intimately familiar with the regional attitudes and customs. · Hank struggles with the values of that subculture. · Hank ultimately accepts or rejects the subculture (by reasoned or arbitrary means). The tension between tradition and new thought is constant, ultimately striking a perplexingly palatable middle ground. In this regard, Hank truly is the archetypical American male acting as an ecumenical bridge between liberalism and conservatism. The supporting characters in the show are varied across different socioeconomic backgrounds and ideas. Hank is supported by his wife Peggy and his son Bobby. (Their relationship I will elaborate on later.) Hank’s neighbors, all of whom are developed throughout the series, are colorfully nuanced. Dale Gribbel, Boomhauer, and Bill Dauterive serve to contrast Hank’s ideals. Dale is a conspiracy theorist, paranoid and unsettled. Opposite of Dale is Bill, a hopelessly naïve and sad individual, willing to believe anything if the result is his own gratification. Boomhauer is the least developed in the series, but strikes a moderate balance between Dale and Bill while still retaining faults and complexity. 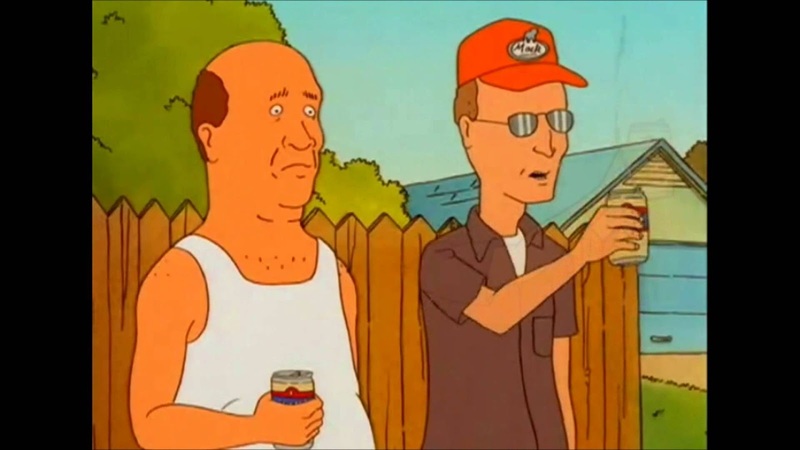 Dale and Bill are easily my favorite characters in the show due to their co-dependency featured throughout the show’s run. Despite being characterized as a conspiracy theorist and always suspicious of the world he occupies, Dale often makes inaccurate assessments of his surroundings. 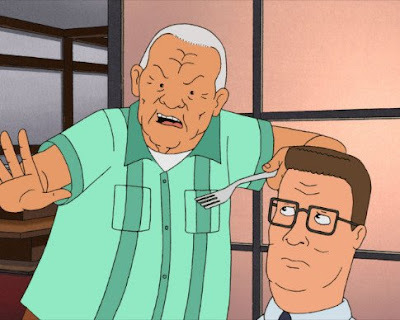 And despite the trouble he gets into, Hank sees him as a friend that he can confide in, even though Hank’s father, Cotton Hill (an embittered war hero), continually presses Dale to antagonize Hank. A prominent plot point featured in the show is Dale being cuckolded by John Redcorn, an Anasazi descendent that drives an open top Jeep blasting 80s metal. Dale is entirely unaware that his son Joseph, with dark, rust colored skin, is not his biological son. Yet, despite being completely unaware of this, Dale continues to be a good father, immersed in his own male fantasy of charisma and sexual bravado. Dale’s opposite, Bill, I believe acts a foil. Where Dale initiates conflict, Bill participates willingly because he is so morosely depressed. Bill’s background is that of a well-to-do football athlete of rising acclaim. Once possessing the bravado and popularity as a record-holding high school senior, Bill’s strength is reduced by a manipulative woman (Lenore) who utterly ruins his life. Bill makes me laugh the hardest, as I watch this picturesque, sad individual constantly undercut himself. Bill’s character is a catharsis to his friends who have, for better or worse, moved on from their high school legacies and embraced domesticity. Bill’s talent as a barber, however, unites him with Hank, as he is the only one capable of giving Hank his signature haircut. But even before this, there is a resounding love Hank feels for his friend Bill, and he is always willing to cheer him up, if only to distract Bill from how depressing his life is. “I was fourteen, just a little older than Bobby. But I knew Uncle Sam needed me, so I lied and signed up. We had beat the Nazzys in Italy, and they shipped me to the Pacific Theater. A Tojo torpedo sent our troop ship to the bottom. I could only save three of my buddies: Fatty, Stinky, and Brooklyn. They were kind of like you fellas [to Bill, Dale, and Boomhauer], only one of them was from Brooklyn. Out of the sun came a Tojo Zero and put fitty bullets in my back. The blood attracted sharks. I had to give 'em Fatty. Then things took a turn for the worse. I made it to an island, but it was full of Tojos! They were spitting on the U.S. flag! So I rushed 'em, but it was a trap. They opened fire and blew my shins off. Last thing I remember, I beat 'em all to death with a big piece of Fatty. I woke up in a field hospital, and they were sewing my feet to my knees." 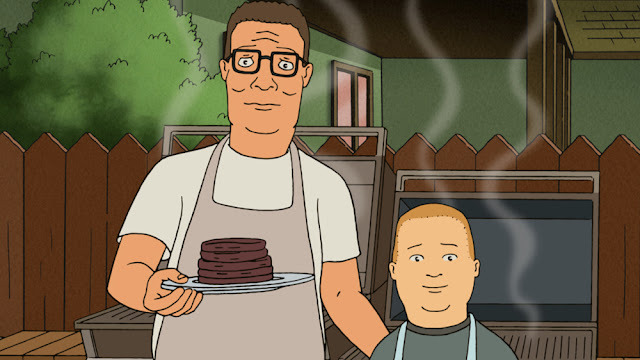 Without any hesitation, I can say definitively that Hank and his son Bobby’s relationship is a definitive study in character development in the medium of television. What I find so charming about Bobby is how different he is from his father. While Hank is very aware of who he is and what he wants to be, Bobby continuously vacillates between hobbies, others characterized as bizarre and unconventional. Bobby’s tenure includes stand-up comedy, professional dog dancing, being a magician and ventriloquist, playing soccer, and adopting a feral raccoon. Each of these bizarre hobbies, of course, irritates Hank, yet the ultimate result is Hanks’s acceptance of his son. This constitutes a dynamic relationship underscoring Hank’s prejudice, but also his willingness to challenge his beliefs because of the love he has for his son. Oftentimes the end result is Hank “winning Bobby over” with his conservative values, but the progressive attitude of Bobby opens Hank’s mind to new experiences and beliefs, chiefly with his relationship with his neighbor Kahn Souphanousinphone’s daughter Kahn Jr. (alluding to Kahn’s own disappointment that he had a girl, instead of a boy). I hope I still have you with me. (I love this show!) Suffice to say, I will leave you with this final picture of how King of the Hill masterfully completed its arc in the concluding season of the show. In the final episode it is revealed that Bobby is very adept at grading butchered meat, and he takes his talent to a national competition where he ultimately wins. The closing shot of the show is Bobby and Hank grilling together (as Hank is an enthusiast of “propane and propane accessories”), finally united by a complimentary hobby. It’s a beautiful moment of unification, where opposites attract and Hank is truly, without pause, proud of his son.